#4 "Rise of the Runelords #4 - Fortress of the Stone Giants"
Product Note: contains material not found in the Anniversary Edition reprint! A sudden assault on the town of Sandpoint by stone giants and a dragon brings the looming threat home. After the giants are defeated, the heroes learn that they were but a scouting party, that the stone giants are massing for war. The only way to disrupt their advance is to strike at the Jorgenfist, the fortress of Warlord Mokmurian, the sinister giant responsible for gathering his people for war. What secrets wait to be discovered in the dungeons below the Jorgenfist, and what is the true reason the giants have rallied for war? 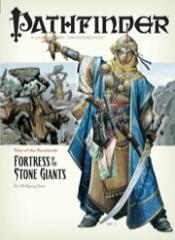 This volume of Pathfinder also includes additional rules and information on the stone giant race, a detailed description of the goddess of monsters and her hideous minions, and several new monsters native to the rugged badlands of the stone giant realm.